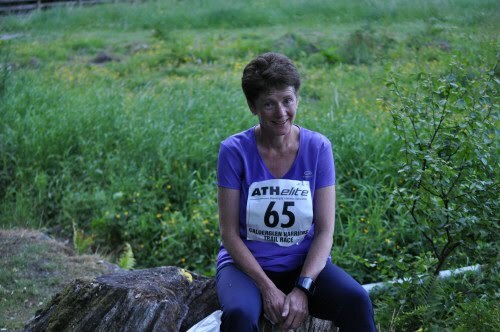 It was my turn to be supporter last night as Katrina ran the Calderglen 10k Trail Race. I had a great time as photographer, using my friend Donald Kennedy’s fancy camera! If you want to see the photos I took they are on flickr. 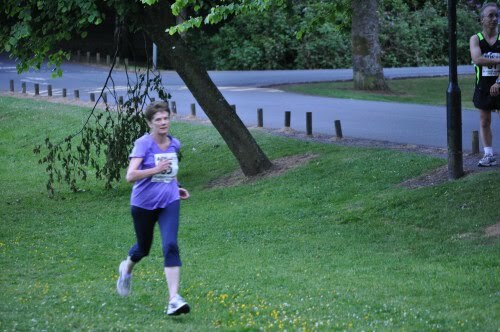 Katrina ran really well finishing in 58mins 45secs. A number of guys from Kilbarchan were also running. It was good to support them too. Enjoying a rest at the end. I’ve keeping to my two week off running but I’ve been doing lots of walking and my legs feel really good. I know I could run but feel a break will do me good. The soreness behind my right knee is almost gone so by the time I start running again I’m sure I’ll be fine. My plan is to have two easy weeks of running from Monday 5th July, then we are off to Thailand (to celebrate our 25th Wedding anniversary) on Saturday 17th July for three weeks where I will do some more easy running. We return on Sunday 8th August and then I’ll have 6 weeks to get ready for the River Ayr Way Race on Saturday 18th September and my last chance to beat Sharon in our series. I’m 2-1 down after the whw race. In fact my 1 is because Sharon had to withdraw from the Hardmoors 55 due to hypothermia!! This entry was posted in Calderglen 10k. Bookmark the permalink.